Houghton Mifflin Harcourt, 9780544191747, 208pp. You don’t need to be a musician or a composer to harness the power of sound. Joel Beckerman explains how companies, brands, and individuals can strategically use sound to get to the core of their mission, influence how they’re perceived by their audiences, and gain a competitive advantage. The key to these sonic strategies involves creating “boom moments” — transcendent instants when sound connects with a listener’s emotional core. The Sonic Boom draws surprising insights from real world examples: the way Disney parks score every second of their guests’ experience; how Chili’s restaurants uses lessons from evolutionary psychology to sell tons of sizzling fajitas, how the sound of a special edition Mustang’s engine is designed to make drivers feel like action-movie heroes. 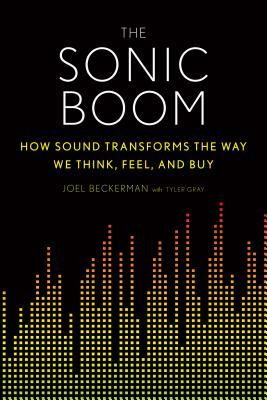 Sure to appeal to fans of Made to Stick and This Is Your Brain on Music, The Sonic Boom offers readers a powerful new vocabulary for sharing impactful messages with sound. Hailed as “equal parts Philip Glass and Don Draper” by Details Magazine, JOEL BECKERMAN is an award-winning composer and producer for television. He is the founder of Man Made Music, a company specializing in sonic branding. Fast Company named him one of their “Most Creative People in Business” and Man Made Music one of their “Most Innovative Companies” in music. He created original scores for more than fifty television programs, won ASCAP’s “Most Performed” theme award for the past eight years, and has developed signature sonic branding programs for global giants such as Disney, AT&T, and Southwest Airlines. Beckerman has worked with John Legend, will.i.am, Moby, OK Go, Morgan Freeman, and the composer John Williams. He lives in New Providence, New Jersey. "The only force more powerful than taste or smell when trying to create an emotional response? Music. The right sound at the right time can slam you right back to childhood, create dread, inspire empathy, turn you on a dime to an emotional jellyfish. The right song at the right time can change—and has changed—the world, leading directly to social change and even revolutions. Music defines us. Joel Beckerman knows. Let him tell you all about it." —Ruth Gaviria, executive vice president of corporate marketing, Univision Communications Inc.